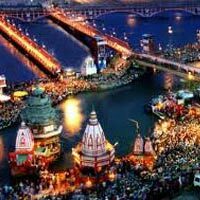 One of the most important Hindu pilgrimages, the Char Dham Yatra, is located in the Garhwal region of the state of Uttarakhand. The pilgrimage takes devotees to four sites, Yamunotri, Gangotri, Kedarnath and Badrinath that are revered by the Hindus and sacred according to the Hindu religion. Each temple is representative of one of the Hindu gods - Kedarnath is home to Lord Shiva, Badrinath is home to Lord Vishnu, Yamunotri represent goddess of Shakti Yamuna, and Gangotri represent goddess of Shakti Ganga. The Yatra starts in a west to east direction, from Yamunotri, then proceeding to Gangotri and finally to Kedarnath and Badrinath. The great Hindu philosopher and reformer Adi Shankaracharya initiated the Char Dham yatra in an attempt to revive the Hindu religion during the 8th century. 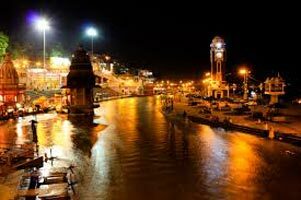 Witness the Ganga Aarti at Har-Ki-Pauri. Visit to Badrinath.Please contact our sales staff to give you best flight deals. 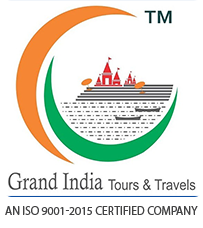 Welcome to your 'Super Saver Char Dham Yatra' tour! On arrival at the airport / railway Station you will reach by own cost at reporting point sharp 9:00am (Hotel Lohmod ,A-292 Mahipalpur Ext, Near Airport New Delhi ) then 9:15 am proceed to Haridwar. 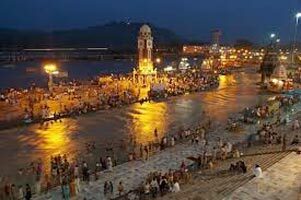 On arrival at Haridwar, check-in to your hotel. The rest of the day is at leisure to explore the city (on your own.) 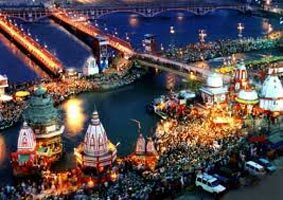 In the evening, you can witness the Ganga Aarti at Har Ki Pauri. Today, after breakfast, proceed to Barkot. Barkot is a beautiful town nestled in the Rawain Valley of Uttarkashi District on the banks of the Yamuna. Via Dehradun and Mussoorie. Enroute visit Kempty Fall and others. On arrival in Barkot, check-in to your Resort. The rest of the evening is at leisure for you to explore Barkot (on your own). The morning will start with the drive towards Jankichatti / Phoolchatti, the base for Yamunotri trek. After reaching there, start your trek (10 Kms trek one way) and reach the temple of Goddess Yamuna by afternoon. The Darshan and puja will be followed by a dip in the hot springs situated there. Here near the temple 'Pooja' can be offered to Divya Shila, after taking bath in Jamunabai Kund's warm water and having 'Darshan' of pious 'Yamunaji'. Return back to Jankichatti / Phoolchatti (On foot ) and further proceed to your Resort. 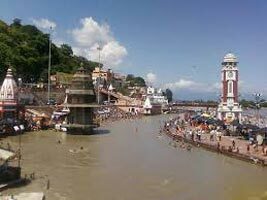 Today, you will drive to Uttarkashi situated at the bank of river Bhagirathi. On arrival, check-in to your hotel. Today, after an early breakfast, proceed Gangotri. Drive along the Bhagirathi river and pass through dense forests. Gangotri Temple, the temple constructed by the Gorkha General Amar Singh Thapa in the 18th Century, is situated on the right bank of Bhagirathi. Shiv Ling is submerged in the river. This natural rock Shiv Ling is the place where, according to mythology Lord Shiva sat when he received the Ganga in his matted lock. It is visible in the winter months when the water level decreases. Kedar Ganga Sangam, around 100 Yards from the Ganga Temple flows the river Kedar Ganga. Starting from the Kedar Valley, this river meets the Bhagirathi on its left bank. Enroute we enjoy picturesque Harsil village, Bhagirathi River and the most magnificent view of the Himalayas After Gangotri Darshan, proceed further to Uttarkashi. On arrival, check-in to your hotel. Today, after an early breakfast, proceed for almost a day long drive to Guptkashi. Enroute you can see the beautiful river Mandakini at Tilwara. The Mandakini river comes from Kedarnath, drive alongside the river to reach Guptkashi. On arrival check in at the hotel. Later proceed for Kedarnath Pre-registration and return back to hotel. Later proceed to Gaurikund by local Jeep from Sonparyag. From Gaurikund start your trek to Kedarnath (3584 mts) on foot or on by pony / Doli. (On your own) proceed to your Guest house and check-in. The rest of the evening is at leisure. One can visit the Kedarnath Temple or attend the pooja ceremony. Pay your tribute at the shrine and spend some time soaking up the peaceful, spiritual atmosphere of the place. After breakfast, begin the 19 kilometer descent on foot to Sonparyag. Later, drive to Rudraprayag via Guptkashi. On arrival in Rudraprayag, check-in to your resort. Post early breakfast, drive to Badrinath via Joshimath. It is one of the 'Four Dhams' is one of the most celebrated pilgrimage spots of the country and is situated at an elevation of 3,133 meters, guarded on either side by the two mountain ranges known as Nar and Narayan with the towering Neelkanth Peak providing a splendid backdrop. On arrival in Badrinath, check-in to your hotel. Later in the evening visit Badrinath Temple for Aarti on your own. After breakfast, having a bath in the Taptkund have the Darshan of Badrivishal. Brahamakapal is significant for Pinddan Shraddh of ancestors (Pitrus). There are other interesting sightseeing spot like Mana Village. Just within the three kms of Badrinathjee.Tapt Kund: Natural thermal springs on the bank of the river Alaknanda, where it is customary to bathe before entering the Badrinath temple. Narad Kund : A recess in the river, near Tapt Kund, forming a pool from where the Badrinath idol was recovered. Brahama Kapal : A flat platform on the bank of river Alaknanda. Hindus perform propitiating rites for their deceased ancestors. Mana Village: Inhabited by an Indo-Mongolian tribe, it is the last Indian village before Tibet. Vasundhara: As the name suggests, Vasundhara is a magnificent water fall. This place is 5 kms from Badrinath out of which 2 kms is motorable upto Mana. Bhim Pul : On the other side of Mana village, a massive rock forming a natural bridge, lies over the roaring Saraswati river: It presents a spectacular view of water thundering down through the narrow passage under the rock and is believed to have been placed there by Bhim, the second eldest among the five Pandava brothers. Later drive back to Rudraprayag via Joshimath. On arrival check in resort. 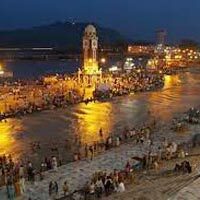 Today, after breakfast, proceed to Haridwar, en-route visit of Rishikesh the 'place of sages' is a celebrated spiritual town on the bank of Ganga and is surrounded by Shivalik range of the Himalayas on three sides. 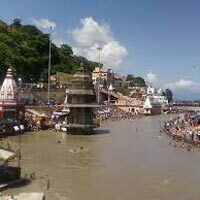 Visit Laxman Jhulla, Ram Jhulla, Triveni Ghat, Bharat Mandir, and Shivananda Ashram. 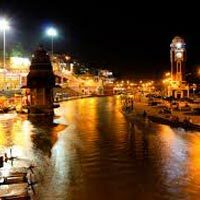 On arrival in Haridwar, check-in at your hotel. The rest of the evening is at leisure for you to explore the city (on your own).